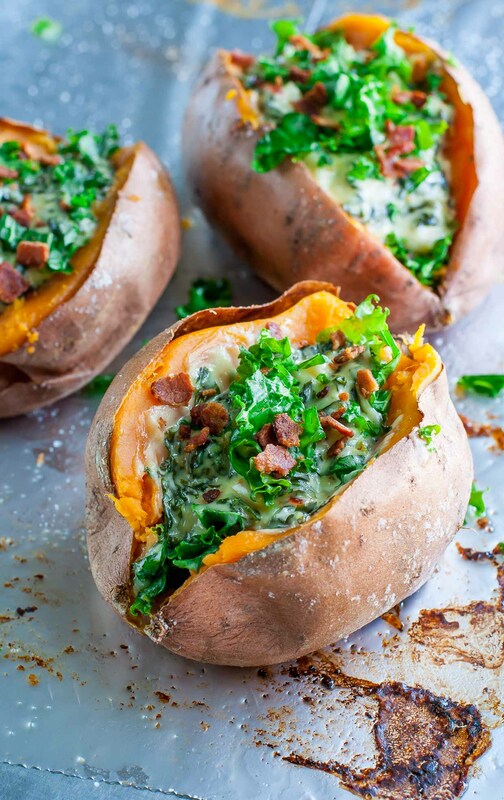 These easy Cheesy Kale Stuffed Sweet Potatoes are a tasty way to pile on the veggies! It’s no secret that I’ve been on a sweet potato stuffing spree. Some days I’ll keep things super simple with fresh arugula and crumbled feta, while other days I’ll go all out with a DIY taco-bar of toppings. More often than not, I simply scrounge for last night’s leftovers and stuff them into a sweet potato. Can’t go wrong there! My recent creation involves the leftover chopped kale from this recipe with the creamy havarti cheese from my bacon broccoli spaghetti squash recipe. A quick scan of my fridge revealed a small carton of heavy cream, which I couldn’t resist turning into a luscious creamed kale. Add a little bacon and garlic for good measure and voila! Lunch! 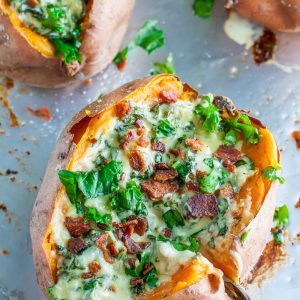 Though I made mine a meal, you can absolutely serve these kale spiked sweet potatoes as a side dish to pair with your favorite protein. 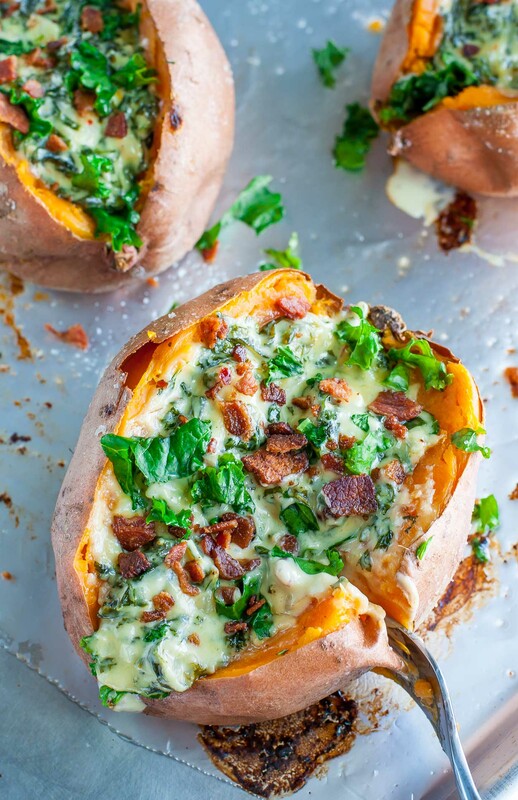 A little swap of the bacon will also make these vegetarian to boot! Ready to cream some kale? Now let's cream some kale! Remove the middle stem from each leaf and wash thoroughly. Chop into small pieces. For bright green and super tender kale, we're going to blanch it before creaming. Bring a small pot of water to a boil and add your kale until bright green and tender, approx. 5-10 minutes. Rince with cold water in a colander and set aside. Return the same pot to your burner over medium-high heat with a drizzle of oil or butter. Add your garlic and sauté until fragrant, approx. 1-2 min. Add cream and 90% of the kale and keep heat at a simmer. Cook until cream begins to reduce and thicken. Stir in your cheese and add any additional seasoning to taste, if desired. Garnish with crumbled cooked bacon and extra chopped kale. For a kick, add a sprinkle of crushed red pepper flakes! Short on time? Skip baking in favor of microwaving. Pierce with a fork and cook on high for 7-8 minutes. Depending on size, yours may be done quicker or require an extra minute or two. To make these potatoes extra cheesy, use havarti or any other creamy, melty cheese of your choosing. Gouda or a Mozzarella-Parmesan combo, for example. For a more traditional creamed kale, feel free to use parmesan cheese instead! It won't look like the photos but will still be super tasty! brontosaurus chefs: Bacon bits or tempeh bacon make a fanastic sub for the bacon I topped my sweet potatoes with, though you can also skip it entirely! 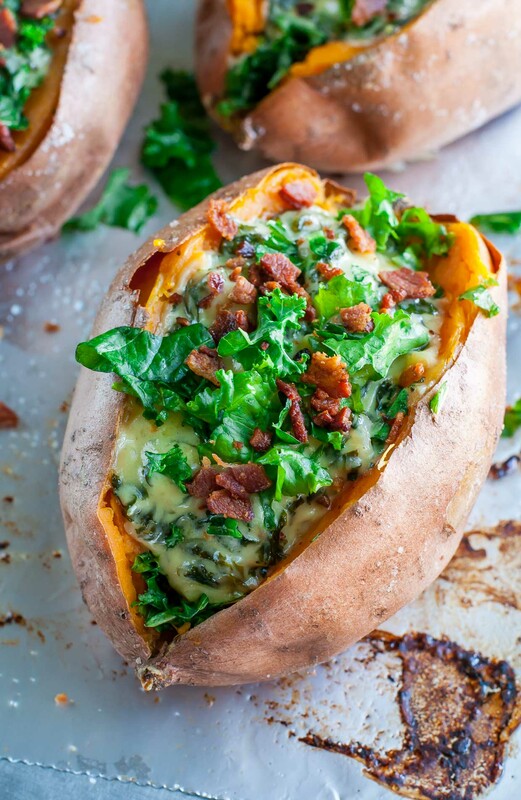 Sautéed mushrooms and/or onion would also make a tasty addition to these stuffed spuds. vegansaurus chefs: Fret not! You can easily veganize the creamed kale portion of this recipe. Whole Foods Market has a pretty tasty looking vegan creamed kale recipe on their website if you want to check it out! As for the bacon, skip entirely or use your favorite vegan-friendly swap. I’m a huge fan of making wild mushroom “bacon” for salads lately – so good! t-rex chefs: Pair these sassy spuds with your favorite protein dish if you’d like or even add some shredded chicken to the potatoes themselves! You can absolutely, positively sub spinach for the kale here or use your favorite creamed spinach recipe. As a crazy awesome love your leftovers swap you could even use leftover spinach dip here – HOLY YUM! You’re super welcome Sarah! Enjoy! Hi Carine! What about cooking some chopped broccoli (into teeny tiny bites) in the cream sauce? 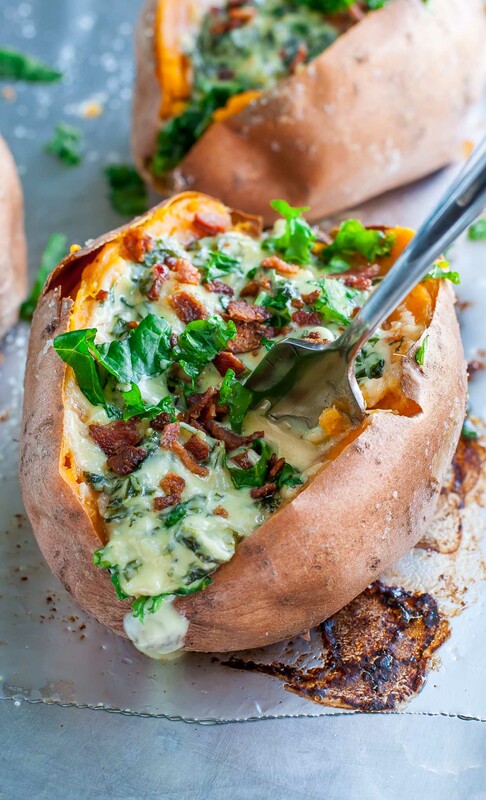 I think that would be wonderful, kind of like a loaded broccoli cheese potato! These were delicious!!! My three year old was asking for more and more!! I used gouda instead of havarti because it was what I had and the flavor was incredible. Thank you!! 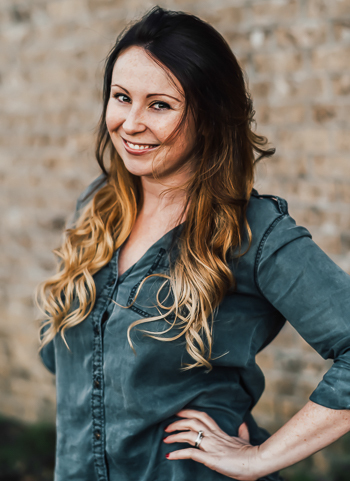 So so happy to hear it Jessica! Thank you!